You may find the video from YouTube with the same title: "The Free State", the following is the transcripts. In the way, I will help you to identify better with that which you really are, and with a lot of helpful hints, and how to identify with the Real You that you that never ever changes, that you ever whole-complete-perfect. The You that you are trying to get to, in everything that you are doing. The You that you are looking for where it isn’t – externally. One reason why I say it is easy is because you are trying to find You. How difficult is that? Also in your every moment, you are experiencing the Real You. You cannot help but experience the Real You – when you say “I”, that is – “I Am.” It is the beingness that you are – that is you. And, if you really love your body that much, you’ll do it. To stay in 18 all your life, may be 16… But, we should look toward the part that we really are, bring it out, identify with it, make it part of our conscious living. I Am I, get the sense of only I, I, I, I, I Am, I Am that I Am. When I say, “Are you?” You say “Yes.” O.K, that is! Just “be” that ONLY. And you are [now] in the state that you all the time striving for with misery. Misery moving away from that state where you identify with your beingness. The only happiness there is – is being in your beingness. It is just quieting the mind to satisfying the desire, and the mind is quiet you just being, and that is the happiness you feel, and that is the only happiness there is. How many have discovered that yet, that there is only one single happiness – “that’s when you being your beingness.” O.K, that is a big assist, because it alleviate, do away with all that effort looking for it out there in a million directions. Now, that doesn’t stop you from doing what you are doing out there, it doesn’t matter what you do – what matter is your attitude toward it, your understanding of it. You sure make life much easier when you identify with your beingness! Trying to get yourself placed on a scale of where you are. It’s good to see yourself objectively. There are two benefits for doing so. One is when you start, all your garbage, your emotion come out for releasing. And then, when you watch it, it is entirely different, isn’t it, when you watch it? Because the first part is very subjective, “Is me, the problem that I pet” – garbage! And, is not what it looks like objectively, we don’t see ourselves the way we really are. So, when we come back and look at it, we want to hide most of it, don’t we? “That’s not me, I didn’t do that...” But, you see yourself objectively, it helps you move into the point of garbage that you are very much avoiding. So, when you identify as to where you are, and you see it objectively, you can say, “Oh boy! I am on first step.” Or, “I am on the tenth step, I got to move.” So, identifying is part of seeing yourself objectively. You are your beingness, that is the real part of you. And then, it develops all these Programs over the ages, and the programs motivate the thinking. The Programs are your Feelings. I don’t know are there any part of the world that psychologist and psychiatrist today accept feelings as programs. They are still blinded as what they are. I think they accept them as natural and right, just adjust them a little bit, so things get a little better. But, Feelings are simply Programs, subconscious, automated programs of how we react to the external world. And, everyone of them had been put as a pro-survival program in order to keep the body surviving. How many of you see that all these feelings are survival program? That’s Great! You get to see how silly is, when you trying to survive a situation that you are eternal being. That is what you are doing. You have no choice, you are eternal. All these struggles trying to survive, but where is the error? What do you trying to survive the carcass, as I used to say that you are driving around in that car is your case, got you closed in there. So, in your beingness, you create your mind, and start programming everything, and you think you are the body, and you think the world is external to you – after you have created it. You Let Go, by remembering that you created the whole thing, and is all created here in your mind. Change your picture mentally and instantly change it out there – call the Miracle! I believe most of you have experience instantaneous changes out there. How many have experience? There is nothing out there, is just sum of total thinkingness, most of which is subconscious, and there it lay the problem. Subconscious mean simply we do not want to look at it. The mind is a tremendous mystery to the world because they don’t understand what it is. I can see the simplicity of it – is the sum, total of all your feelings and thoughts, that’s all. How simple it is, is a collection of your feelings and thoughts, and everything you experience is via the mind. Go unconscious, mind out the way, and there is no experiencing. So, do your best to identify where you are at. Most of the time, are you identifying with your body and the world? The answer is yes. But you can make it otherwise. You continue in what you are doing, but shift your identity from being the body to the being. Identify with the Beingness, and you just sit and watch the world goes by. You get into a state of witnessing, you don’t even feel yourself moving because you cannot – you are omnipresent. When you identify with you beingness, you discover are everywhere present in the entire universe. And should you choose, you can take a look-see anywhere in the universe without moving because you are there. You don’t even have to do Astral Travel. You are Omnipresent. Astral Travel is in the Mind. Astral Body and Mind are almost one in the same thing. So, identify where you are at, make a decision to cut the journey short – go free. Why agony when you can be free? So, the Real You is the Beingness. 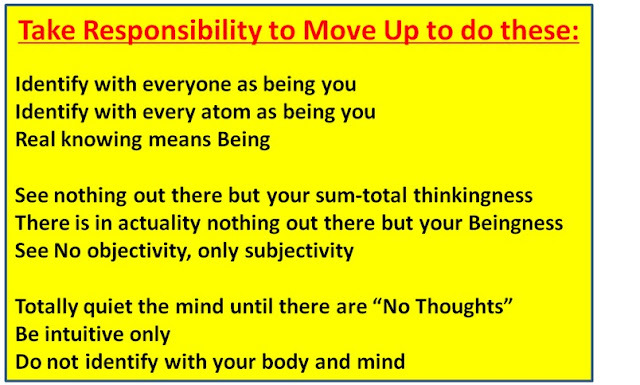 The Ego-you is 2 and 3(refer to the diagram above), is in your Mind and your Body. And your three states that you identify with are Beingness, Doingness, and Havingness. With this you can relate to the Chart of Emotion. Apathy, Greed and Fear are down in Havingness Only. When you are down there, you think of your well fare – depends on how much you can have, and you spend all your time trying to make and have. As you move up into Lust, Anger, Pride, and Courage, is moving towards Doingess. Instead of thinking your well fare lays in Having, you feel that you got to be a Doer. Of course, that is in an advance state, and on 5 percents of us are Doer. 95 percents of us are wanting to Have. We are down so low that we are putting ourselves in the state of being a slave – we must have a job, someone must told us what to do, and give us the food that we eat, and the money to get our lodging. The ONLY reason why people work in jobs is that we are having a slave consciousness, we are down in the Havingness. Apathy, Greed and Fear that is where most people are riding them majority of the time. Move up onto Courageousness, Pride, anger and Lust, then you got to be a Doer. Which is a much freer state than being a slave. And, when you get into the state of “I Can Do”, you got enough wish and well to move to the top. Because you discover when you just quiet in the being that is the nicest thing there is, and with the Doingness energy, you work harder to drop the remaining limitation – the AGFLAP, so that you can remain in just to Be all the Time. Now, that sense of beingness is not related to the world. It relates to how you look at the world. You watch the world go by, you watch yourself, you watch your own body moving around like you now watch other body. You see your body objective to you like you see other body objective to you. So, do your best to move up to constantly identify with your Beingness. Hold on to “I Am” or “I – I – I” Only. I Am my beingness – I Am, I Am I Am-ness. Be No the Doer. And then when you get to be a Doer, then do your best to see that you are not the Doer, that all that are objective to you. Take the attitude “I Am not the Doer.” And what happen there is you let go the Ego-sense of doing and shift into allowing the higher power or whatever you call to do it. In religion, they say “Let go, Let GOD”, can he do it? Yah, he can do everything. When you let go of your ego-sense, you automatically move into your beingness. And that takes care of everything and no effort, your life become totally effortless. And, start to Take ALL Your Happiness from You. Recognize that every joy you have, that nice quiet place of just being, where your desires are out of the way. Even though you are taking pleasure from the world, try to recognize that the pleasure is being you – your mind is quiet, now on the way, we would identify anyone as us, see everyone as you, and that is what happen when you see that you are beingness, and that your beingness is all beingness, so it includes everyone. So, you see other people as you. Then try to identify with everything out there, every atom as you, because it is your making. And when you identify with it, you get to see that you created everything that you experience. It is all in your mind – all your experiencing. It is all in your creative mechanism, mind is only creative – create with thoughts that we hold in Mind. And, in the end knowing this being, you can get to know yourself as two things: I knowing myself, I Am myself. So, the ultimate knowing drop away into being, all knowledge drop away into being. You let go of all the accumulation, that you spend life time accumulating in the way as knowledge, because these are lesser knowledge than omniscience, it is all limited knowledge limited by the mind. And, you let it go and you discover that you are omniscience, you are all-knowingness, back to which you don’t have to work hard thinking, there is no more thinking, you are knowing, and your knowingness is no thinkingness. So, see nothing out there but your sum-total thinkingness. There is in actuality nothing out there but your Beingness. See No objectivity, Only subjectivity. It is good that you memorize all these key points in the diagram. These are stuffs I believe you don’t read in books. So, it is good to keep it in a way that you can come back to look at it. This is Taking Responsibility for everything that happens to you – “What did I do to cause all these awful thing?” à You Become It, the Capital “I”. To know that habit, and your initiating thoughts, direct coming out that and you release them, so that negative happening out there would stop. The less negative happening, the more positive happening acquired, your life is easier to go on. If you constantly being play by death facing you, it is difficult for you to release. But, if your life is easy, you are in a better place to release. You are not so fearful of your program any more. You will able to allow bottom program of the fear of dying, the fear of living, and release it. And when you continue this, see nothing out there but your sum-total thinkingness, then you discover there is, in actuality, nothing out there but my beingness. 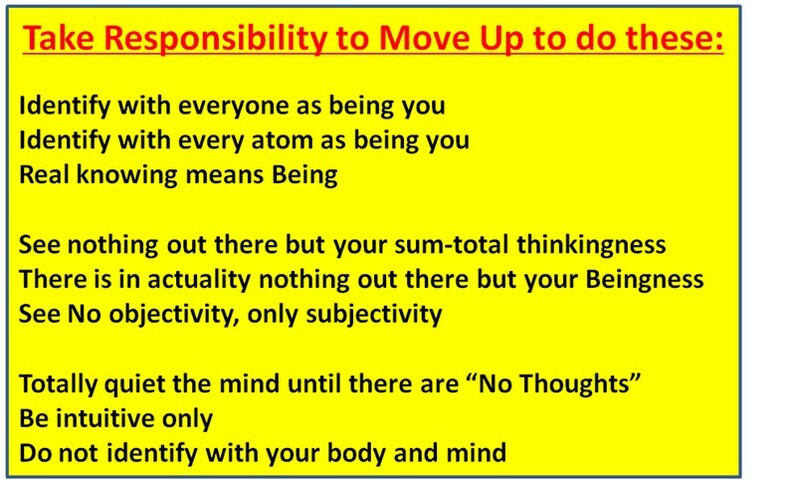 It remind me what Yogananda had said, “When you get to the end of the line, you discover that there was anything but I all alone.” I, my beingness, am the totality of all beingness, and that is the only real thing there is. Your beingness never ever changes, your beingness is eternal. And, because it never changes, it is the only truth. If something changes, there was not true the moment before. For a thing to be true it has to remain as it is. And the only thing that you would experience that never change is your beingness, which you are right now, identify with it and move toward your beingness. And you reach a point where you begin to see no objectivity, nothing apart from me, there is nothing out there but the my sum-total thinkingness. You are me. 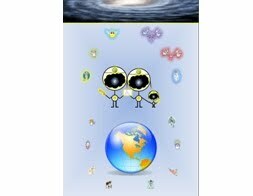 Every atom in the universe is me. This is what you would see, as you stay, as you identify with your beingness. Here we are trying to scratch for a little piece of it, but the totality of it is ours – GOD creation. So, we work and work, and release and release until there are no thoughts. Now, every one of you experience moment when there are no thoughts – as the tremendous state, but that moment as a piece of garbage come into play, it pulls you from that nice quiet place. And, some of you think that is the noise out there it is real, not the beingness, and we move away from rather than try to stay in the beingness. Now when you get there, you will be intuitive only, you operate in the world without thinking. You be offensive to no one. You have answer for everyone. You can talk to people on their subject and help them. And as you are doing it, you are watching your body talking and answering their questions, and you are just listening to it just like they are. Does it sound Good! So, do not identify with your body and mind. What is left? Your Beingness, your Is-ness, your are-ness, your am-ness, your existent-ness. That is the part you that is real, whole-complete-perfect-eternal, that is the part of it that you are struggling to get to in everything that you are doing. You never rest until you get there! 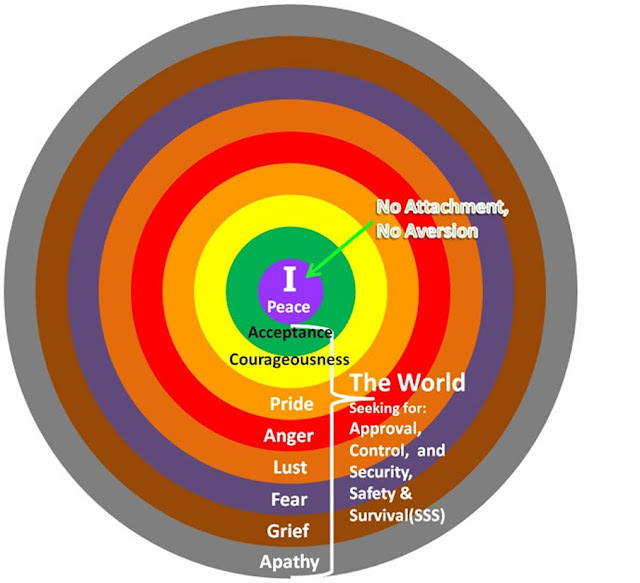 To sum up: Have NO ATTACHMENT AND NO AVERSION, AND YOU WILL HAVE EVERYTHING. You have the ALL, the universe will be yours. For in your universe, you have created it, it is yours in the first place. You just let it be, you just remain identify with your beingness, which is the greatest thing there is. The words in this diagram help you to set your goal. The word I like best is “Imperturbability” – a place where there is nothing and no person can disturb you. Even if someone trying to kill you – how can they do it for you are eternal? aim to release all your desires. For Effortlessness, do your best to move towards less and less effort. Of course, you got to move up, out of the Havingness state into the Doingness state, before you can make thing effortless. So, when you let go and identify with your beingness, thing becomes effortless. The sense of Actionlessness of not being the Doer. Work towards that, and towards Witnessing everything that is happening. Sit back and be the witness. And when you reach the top, all these things are in place, and that is the way it will be. Those are the words that I like best in the top state, you might some other words you could add in. We Must Get Rid of the AGFLAP in order to CAP it. And, looking from the Right to Left, it is a PAC-man that gobbles up the AGFLAP. But, you need to get up here to the CAP, in order to gobble up the AGFLAP completely. (You must get high to release.) It is from the high point, that which you reach down into suppress ‘fear of dying’. Allow it up, so that you can let it out. O.K. That is the end of my talk for today. Be yourself, you got no choice. No matter how much you try otherwise, you are always end up, eventually, being yourself only. Why Not Now? Why Take Time? O.K. Thank you. “Momentum is very important in getting realizations. You stay with something, it becomes clearer and clearer as you stay with it. But if it starts getting clear and you move off, when you come back on to it, it's more difficult to get into it again. And so, I am anti-talks, tapes, because of that. I can see it doing harm in that it doesn't let you stay with something, because the conversation goes on and on and you move off one thing onto another — to another without getting a realization of any one of them. 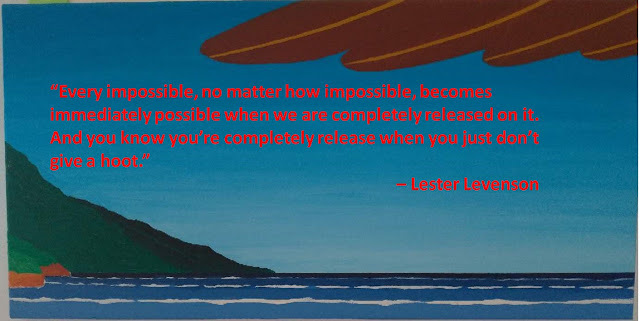 I believe you got much more good out of reading the book…” — Lester Levenson.